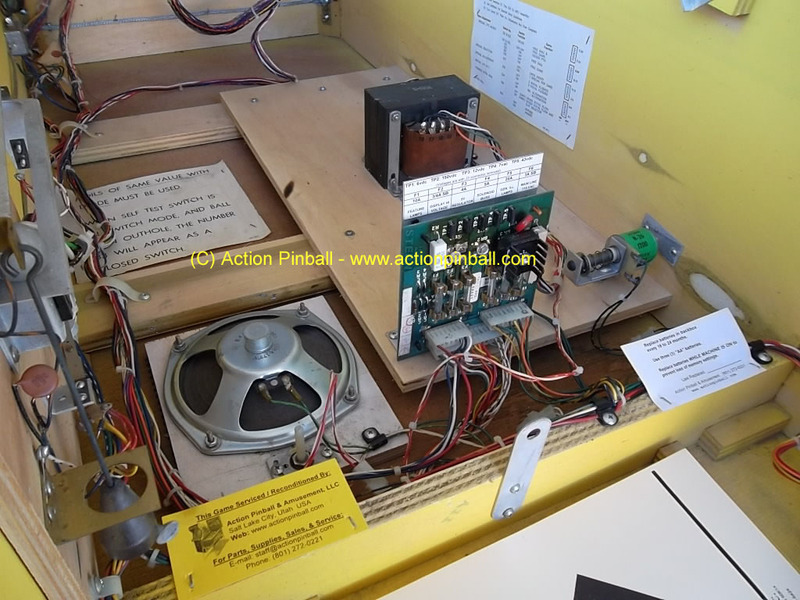 The procedures described below are recommended only for persons who have an expert level of technical ability and experience working with pinball machines, flipper parts, and electronics. If you are interested in doing a flipper upgrade on your game, as described below, and don't have the necessary skill level or experience, we strongly recommend enlisting the help of a qualified person to help do the work for you. In our local area and need help? We can do the work for you- see our Game Service and Repair page for more info. 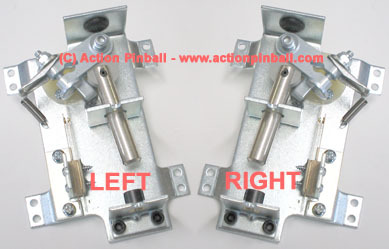 New replacement parts for most older-model pinball games can be difficult or impossible to find anymore, since most of the original manufacturers have been out of business for several decades and new replacement parts simply aren't available anymore. Newer style flipper mechanisms are usually a much better design than older units and will perform and last longer. Replacement parts for newer mechanisms are usually readily-available in the current market and can be easily and inexpensively obtained. One upgrade we recommend is replacing your original flipper assemblies with later-model Bally/Williams mechanisms- such as the type used on Williams games from about 1986-1999, and Bally games from approx. 1988-1999. Full flipper assemblies (less coil and flipper bat/shaft) can be found and ordered on our Flipper Parts page. Flipper assemblies are available in both left and right side units, and are available for older model games (using high voltage EOS switch- up to approx. 1992) and later model games (using low voltage EOS switch- approx. 1992-on). When using the later-model units, you can either keep and re-use your old flipper coils, or you can purchase new coils- either in the old original style, or later-model coils- all depending on your personal preferences, what game you are working on, and your own technical abilities. Replacement coils are available on our Coils & Coil Parts page. Need help selecting a coil? Just e-mail us with the name of the game you are working on, what type flipper assemblies you're installing, and we can help. For example, if you are working on an older game that uses shorter 1-3/4" flipper coils (such as Bally games up to approx. 1987, Williams games up to 1980, Stern solid-state games up to 1985, etc), you can keep and re-use these coils on the new assemblies. The only requirement for doing this is that the new flipper assemblies must have two new screw holes drilled and tapped in the baseplate, to mount the front coil bracket further back, to accomodate the shorter coils (as shown in picture above). This requires some special tools, and skills in measuring, drilling, and tapping for new screw threads, in order to properly re-locate the front coil mounting bracket further back on the baseplate so it holds the short coil secure. The baseplates for each unit seen in the picture above have had new holes drilled and tapped for mounting the front coil bracket further back (due to the shortness of the original style coil). You can see the original screw holes for the longer style coils (used in later games) still in place. 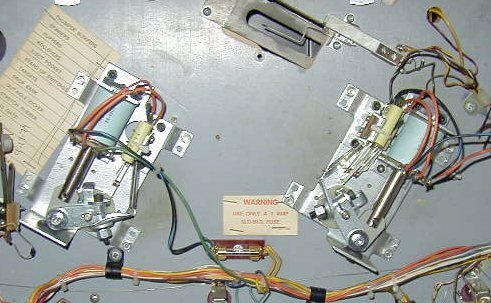 Some later-model games used longer coils (approx 2-inch) which the new flipper assemblies are already set-up for. On some games you can upgrade from the old short flipper coil to the later-model longer coil. There are some variables to consider such as the wiring configuration and voltage used by the game you are working on. As an example, if you are working on an older Williams solid-state game such as Flash, which uses the SFL-20-300/30-800 flipper coils, you can scrap these and install the longer later-model Williams solid-state coils which are SFL-19-400/30-750-DC (as used in Firepower, Black Knight, and later games). The longer Williams coils can also replace shorter coils of other makes/models, including Stern, Bally, and Gottlieb. The voltage used for the flippers in your game must be adequate enough to make the new coils work properly. This is rarely a problem, but always good to check before doing all of the work. Power supply must be able to supply enough current to drive the coils. Some coils will require more current than older originals. This may require some upgrading or replacement of your game's existing power supply. Wiring must be connected to new coils properly. Not all coils use the same wiring, so you must verify that wiring is connected properly, including wiring for the EOS (end of stroke) switched used on the flipper mechanism. Wiring in the game must be hooked up to the coil properly- in regard to the orientation of the coil diode(s) and the two windings used in the coil. Some experience with electronics, working on flippers and coils, and reading wiring diagrams (schematics), is a requirement for doing this correctly on your own. See the following section on wiring for more details. If you want to replace the coils in your game and are using a different type coil or a different brand coil in your game (such as a stronger/weaker coil, an older/newer coil, a Williams coil in a Bally game, or a Bally coil in a Stern game, etc), you can do so as long as you select the correct coil based on the voltage used in your game, and connect the wiring properly to the new coil. Note that in most all cases, the way the wiring is connected to your original coils will not be the same as the way it needs to be connected to a different coil. Some examination of the replacement coil and it's configuration will be required in order to properly hook up the game's wiring to the new coil. Your game's existing wiring and the wires to the EOS (end of stroke) switch must be connected to the new coil in respect to the orientation of the diode(s) on the coil lugs. If not, the diode(s) will act as a short-circuit and cause a fuse to blow and damage or completely destroy (short out) the diode(s) when power is appled. The cathode, or "banded" side of the diode always connects to the "hot" or "power" wire. The anode, or "non-banded" side of the diode always connects to the low side of the circuit (return or ground side). See diagrams below for more detail. As long as the wires are connected properly in respect to the diode's orientation, then the coil will work. The actual coil winding wires themselves that make up the "coil" itself may require the game's wires to be connected to the coil lugs in a specific way- sometimes the "hold" and "power" windings in different or replacement aftermarket coils are "swapped" so the wiring on the coil and EOS switch have to be swapped as well. So if you connect the wires properly in relation to the diode orientation, but experience a problem where the flipper is "weak" or the coil heats up quickly, then these can be good indications that the "power" and "hold" windings in the coil are swapped/reversed and some wiring needs to be changed for proper coil performance. This is not something that everyone will be comfortable doing or even qualified to do, so enlist the help of an experienced service person if you require assistance, or consult online do-it-yourself pinball repair info on sites such as www.homepinballrepairs.com, www.pinrepairs.com or www.pinrepair.com. The wiring diagrams in the back of your game manual can also be a significant help in identifying the power wire, "low" (or ground/return) wire, placement of the EOS switch on the coil lugs, and the proper connection of these items in relation to the orientation of the diode on the coil lugs. Again, please be aware that this "original" configuration may not apply when you are installing a different replacment coil- always inspect the coil's actual configuration to determine how it needs to be connected to existing game wiring. Wire colors, coil types, and the way they all connect, will always vary from year to year, manufacturer to manufacturer, and even game to game, so it is important to understand and identify everything correctly before attempting the work. These are important aspects of connecting a coil to any wiring- there is only one way to get it right, but many ways to get it wrong and end up blowing a fuse or shorting out and destroying the diode(s) on the coil lugs. If you are installing different coils in your game, your power supply may require upgrading or replacing in order to be able to supply enough current to the new coils and not cause fuses to blow or rectifiers to fail from overload. This all depends on the type of game you are working on, it's original wiring and power supply configuration, and the type of coils you are installing. For example, on many older Stern solid-state pinball games that we have reconditioned, we have installed later-model Bally/Williams flipper assemblies along with the longer Williams flipper coils (SFL-19-400/30-750-DC or FL-24-600/30-2600). These coils require a bit more current than the original power supply in these games is designed to handle. To remedy this problem, we have replaced the solenoid power rectifier (BR3) on the power supply board with a larger unit- a 35 amp 400 volt unit- our part # REC3504W on our Electronic Parts Page. Installing this larger rectifier on the original power board requires mounting it from the front side of the board, and optionally installing a heat sink on it to help keep it cool. These flipper coils also require the coil fuse on the power supply board to be increased in current size- we replaced the original 5-amp fuse with a 6-amp slow-blow fuse (good for 2-flipper games- games with 3 or 4 flippers may require a larger fuse). Flipper bats can often be retained and re-used. This gives an "original" look to your game, even though the parts under the playfield have been upgraded. If you need or want to install new flipper bat/shaft units, you can purchase white or yellow flipper bat/shafts from our Flipper Parts page. Obtain new assemblies (baseplates and mechanical parts). Obtain new coils or retain and re-use your old ones. Obtain new flipper bat/shaft units or retain and re-use your old ones. Remove old flipper bat/shaft units from game. Cut or desolder wires from flipper coils (you may want to label the wires before cutting if you will be re-using your original coils). Remove old flipper assemblies completely from game. Install coils on new flipper assemblies and properly connect wiring between coil and EOS switch (for older games using high-voltage EOS switch). See section above on wiring for more details. Properly orient and install new flipper assemblies in game so that they don't interfere with any other under-playfield parts (slightly moving/relocating some parts may be required in some games- light sockets, wire harnesses, etc). Install flipper bat/shaft units, align, and tighten. Adjust EOS switch on each flipper assembly for proper operation. Properly connect wiring to flipper coils on new assemblies. See section above on wiring for more details. Verify that your existing power supply is adequate, or is properly upgraded, if you are installing different coils that require more current. New flipper button switches. Button switches in the main cabinet can often be worn and pitted, preventing an adequate flow of current needed to operate flippers properly. New flipper rebuild kit for future repairs/rebuild down the road. All parts in the Bally/Williams kits are compatible with the flipper assemblies described in this article. This should be enough info to get you started on your way to better flipping. Some experience/skill is required for this type of modification. If your skills aren't up to the task, consider enlisting the help of an experienced pinball repair/service person. If you need more info, feel free to e-mail us, or for more information on rebuilding and assembling Williams style flippers like these, you can browse online repair guides such as www.homepinballrepairs.com, www.pinrepairs.com or www.pinrepair.com.